Security grilles are an effective non-obtrusive means of protecting your premises. They are easy to maintain, even easier to use and can offer high levels of security all whilst looking good too - what more could you want from a physical security product? 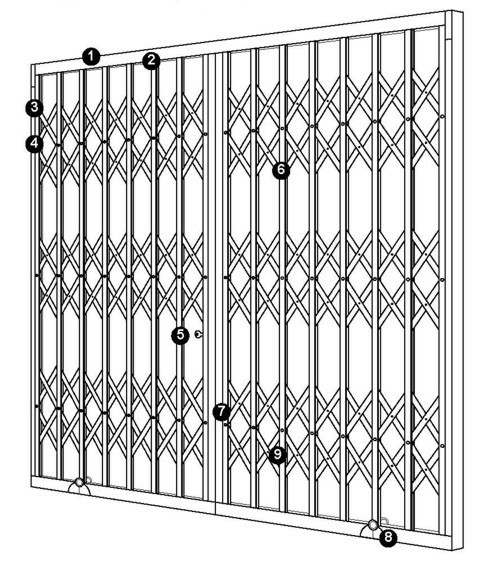 Retractable security grilles, also known as security gates, are available to protect both your home and working premises. Some of our retractable grilles are so secure, they are recognised, tested, certified and approved by insurance companies. In shop retail locations, security grilles are aesthetically pleasing but allow merchandise to be displayed safely 24 hours a day. In offices they let the light in and you can even open the windows in most cases for fresh air and ventilation but without a comprimise on security, the opportunist thief is foiled. The SeceuroGuard 1000 is for higher security domestic use and medium security for commercial, retail and counter/cabinet applications. 'S' lattice design option. For a police and insurance approved grille tested by the LPCB have a look at the SeceuroGuard 1001. Designed to keep intruders out while letting maximum light in, they are perfect for any medium to large window and any vulnerable ground floor doors or windows. When not in use these strong retractable gates are surprisingly unobtrusive. Fitted to the door or window surround, they can disappear neatly into an unobtrusive 'stack' which if colour co ordinated does literally dissappear. The opportunity to remove the bottom guide track from the opening (an optional extra) leaves doorways and shop entrances free from obstruction. Installed inside a window, retractable gates deliver an exceptionally strong yet aesthetically appealing barrier against intruders, which allows merchandise to be displayed safely, 24 hours a day and computers and belongings to remain in place safely in offices. Perfect for medium level security office use including retail and counter/cabinet applications.